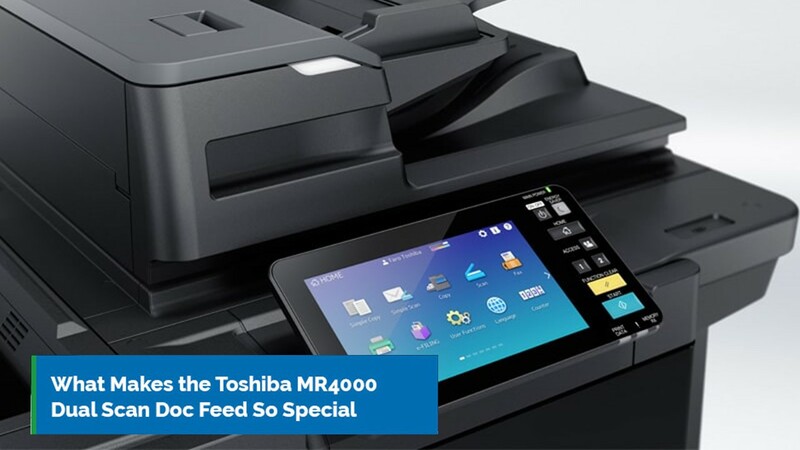 What Makes the Toshiba MR4000 Dual Scan Doc Feed So Special? Investing in a powerful Toshiba multifunction printer can save your office a great deal of money over time. It can also reduce employee inefficiency and promote smoother workflows for completing a wide range of departmental tasks. Consider that in the average office environment, many businesses print over 10,000 pages of paper per month. The majority of that paper ends up in the trash, and almost all of it could be put to better use through more streamlined document processes. Toshiba’s modern fleet of multifunction printers helps achieve this kind of efficiency by offering networked scanning options that reduce the need for employees to make paper prints when not absolutely necessary. This can also reduce paper jams and, consequently, help desk calls and expensive printer downtime. The Toshiba MR4000, in particular, is a powerful tool in any office technology arsenal. It can scan more than 240 images off of double-sided paper per minute. This represents a key advantage in the fight against paper waste. Why Print When You Can Scan? In most cases, printing costs businesses more than it is worth. In a conventional office environment, printed pages make up the majority of communication between departments when scanned images and email would actually perform better. It is in these same departments that multiple employees print a single document out multiple times, each one adding to the ultimate cost of the document’s paper usage. This puts an unexpectedly large draw on office print process owners. It’s estimated that between 37- to 41-percent of print-related expenses bypass formal procurement processes. That means that nearly half of your print costs go unreported and remain unknown to anyone in your organization. Digital scanning is one way to address this issue and begin controlling costs in your corporation. Toshiba scanners are well known for the depth and quality of their color imaging capabilities, and the latest Toshiba multifunction printers on the market offer even more to offices with tight technology budgets. Toshiba’s dual scan document feeder is fast and powerful enough for a single employee to scan an entire book on standard-sized A4 paper in less than a minute. This means that within a larger organization, there is no longer any reason to send large stacks of documents from one end of the office to another. The amount of time it takes to send a single invoice or an entire folder full of quarterly reports going back years differs by less than the time it takes to walk to the Toshiba MFP. Speeding up your office’s ability to communicate while removing opportunities to generate waste is just one step towards becoming a more responsive and dynamic company, capable of handling heavy workloads with ease. Optical Character Recognition. When scanning large documents, the most helpful feature Toshiba offers is the ability the automatically turn the scanned images into editable, searchable, indexable documents. Toshiba supports the automatic creation of PDF files, Microsoft Word documents, and more. Benchmark Security. With printer security becoming an increasingly important aspect for organizational cybersecurity practices, it’s more important than ever that you use a multifunction printer with a self-encrypting hard drive and secure encrypted communication channels, like the Toshiba MR4000. Limitless Job Queue. Although Toshiba MFP is fast, you may have more work for it to handle than expected. Fortunately, you can add unlimited jobs to the queue without worrying about losing data or getting cut in line by another employee. Print Around Capability. If your print or scan job has higher priority than the one currently being executed, you can override the current job and tell the Toshiba to print or scan your documents immediately. It will go back to the previous job on its own right after. Multi-Station Print. The Toshiba MR4000 can act as a central node in your print fleet, delegating other network-enabled printers to do jobs for it when it is busy. Scan-to-USB, Scan-to-Email. Toshiba supports a wide range of scanned document destinations, including USB, email, and even cloud storage document archives. The Toshiba MR4000 is just one option among many in the manufacturer’s lineup of high quality multifunction printers. This device is a great choice for businesses planning on producing more than 200,000 monochrome documents per month and that need industry-best performance. Find out if the Toshiba MR4000 is the right Toshiba multifunction printer for your office. Talk to one of our print experts about your needs and schedule a print audit today!